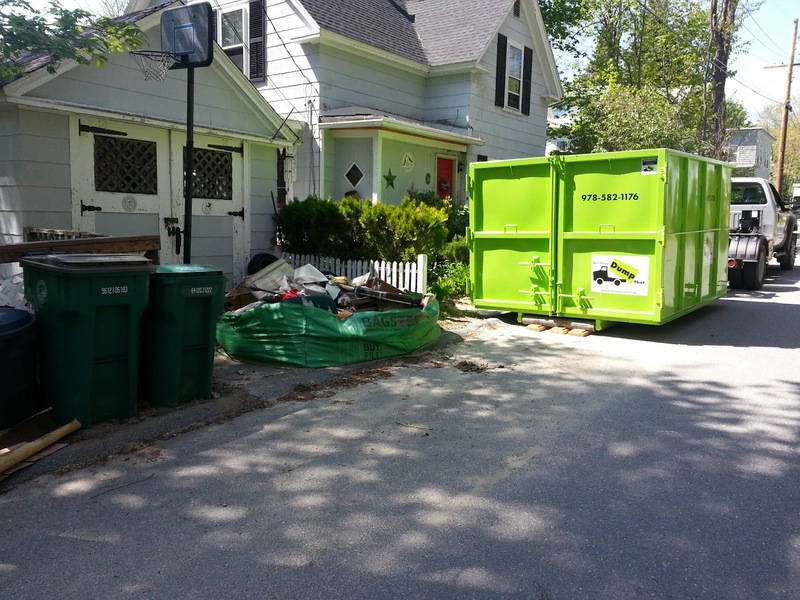 wachusettdumpsterrental: The Bagster vs. Dumpster Rental - Which Should I Use? The Bagster vs. Dumpster Rental - Which Should I Use? Paper or plastic? Dogs or cats? The correct answers depend on what you need, want or prefer. Similarly, dumpsters and the Bagster also have their own sets of pros and cons. So before you use one or the other, make sure to do your homework to see which one is best for you and your project. Here are five things to consider when it comes to choosing between Waste Management's (WM) Bagster vs. dumpster rental from a local provider like Bin There Dump That. The main determining factor for you might be what you can fit in the dumpster or Bagster. Dumpsters come in a variety of sizes from 4 to 40 yard bins and hold both small and large items, including boxes, furniture, landscape and home renovation materials, appliances, clothes, trash and clutter. You can talk with the dumpster operator to see which size they would recommend for your project. The Bagster is designed to handle smaller jobs like garage, attic or yard clean outs and is 2 1/2 feet high, 4 feet wide and 8 feet long. It has a 3-cubic-yard capacity and can hold up to 3,300 pounds of debris or waste. The Bagster is available in one size. They both do not accept hazardous waste. While both can help you clear your home of clutter and unwanted items, they have different levels of durability. The Bagster is a tarp-like material with handles. When you put items in the bag, you'll need to start filling it at the edges to help the bag keep its rectangular shape. You should also lay items down flat and not pile debris above the edges. A dumpster is heavy-duty, allowing you to throw or carry items into the bin. So there's no need to lay items flat, as the dumpster is a hard metal and won't lose its shape. 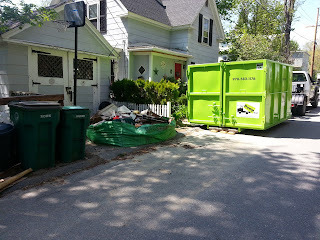 You can put dumpsters and the Bagster on your driveway or yard (with some exceptions). If you want to put them on the street, you'll need to check with the city and ask about local regulations. 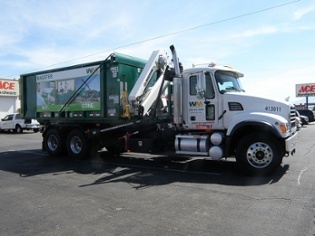 You can have the dumpster operator leave the rental in a convenient location on your property. Just avoid putting it on sloped surfaces, a neighbor's yard or soft ground. The operator will put boards under the bin to keep it from damaging your yard or driveway. Since the Bagster is picked up by a crane on the WM truck, there are some placement requirements. The bag must be 5 feet away from structures or vehicles, have at least 18 feet of vertical clearance and be clear of overhead wires, trees or structures. You should also avoid putting it on sloped surfaces. Another difference between the two disposal methods is the pickup schedule. With a dumpster rental, you can schedule an exact date and time for the operator to pick up the bin. You don't have to be home when they come. Waste Management will pick the Bagster up within three business days from when you call to schedule the pickup. Their collections are made Monday to Friday from 5 a.m. to 8 p.m.
You need to know what your project will require — from the amount of material you'll have to how quickly you want it picked up — before deciding between the Bagster vs. dumpster rental. If you don't have much to throw out and you plan to work on the project for an extended or an unknown amount of time, the Bagster might be the best choice since the price is the same no matter how long you keep it (you pay for the Bagster and then for its pickup). On the other hand, if you have a lot of items to dispose of and want a set pickup date, you'll need a dumpster to hold all of the materials. You also won't have to worry about not being able to fit all of your items in the bin if you end up with more than first expected. 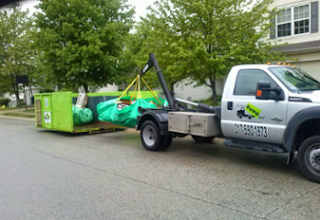 If you decide a dumpster rental makes the most sense for your next project, contact your local franchise operator, and they'll get everything set up for you.